I had wanted to play Zephyr: Winds of Change ever since I saw the look of the cards and ships during its Kickstarter campaign. The theme seemed original and it looked like a game I could get just about anyone to play. 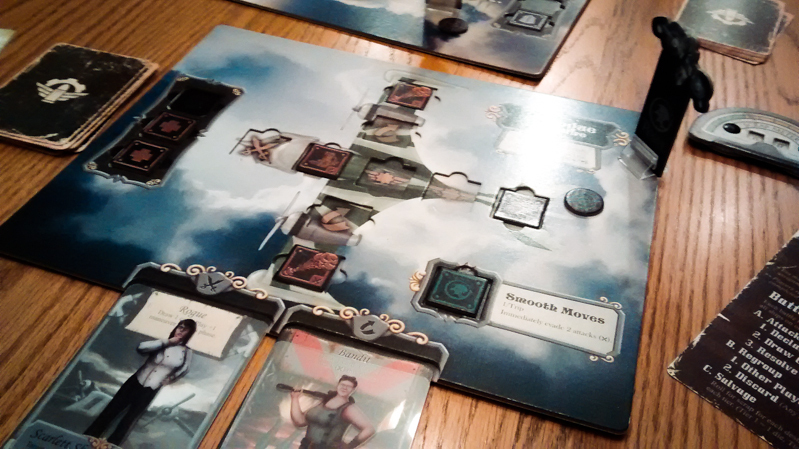 This Zephyr: Winds of Change review is based on one solo game, 3 two-player games, and 4 four-player games. What is Zephyr: Winds of Change? Zephyr: Winds of Change is a thematic cooperative adventure game designed by Aaron Kluck and Jon Mietling and published by Portal Dragon. 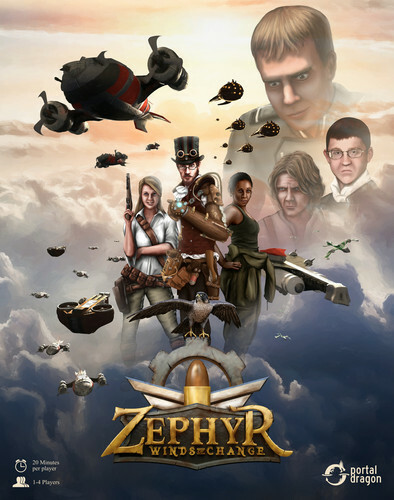 In Zephyr, you are airship captains in a post-apocalyptic world attempting to keep the skies clear of air pirates, which include tough commanders and, in some cases, warlords! When you begin a game of Zephyr: Winds of Change, you’ll get a ship of your own along with that ship’s basic action cards and some starting scrap (money). You’ll buy some starting items, including ship upgrades and crew, and then you’re ready to begin a mission. Each ship has a hull, which represents its health. They also have slots for ship upgrades, which add new cards to your deck that represent attacking abilities, tech, and evasive maneuvers. Even better, you can add crew members, which give you two new abilities – one from the faction and one from the crew member’s personality – that you can use throughout the game. Every ship has a special ability, and they also have their own hull, ship system, and crew layouts. Throughout each mission, you will be going on assignments, either by yourself or with members of your team. These assignments can include battles, reactions to events, or a mix of both. If you’re able to complete an assignment, you’ll usually get a nice reward. You will be fighting in a lot of battles in Zephyr: Winds of Change. 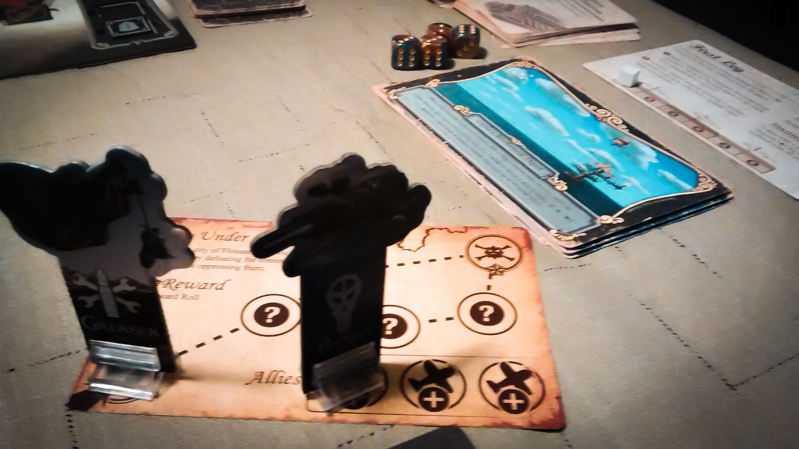 You’ll be using your action cards to deal damage and evade incoming damage in hopes of defeating enemy ships. 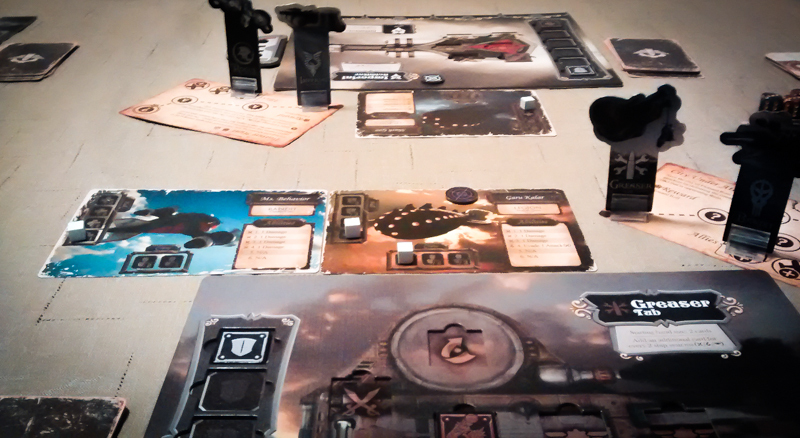 After you’ve chosen your cards, you’ll roll dice to see what the enemy ships do. You and the enemies fight simultaneously, so you can receive damage even if you end up killing your enemy. If another player is on your assignment with you, you can both take on the ships in that area. When you defeat an enemy ship, you’ll roll for scrap rewards. It’s not uncommon to fight commanders in these battles. When you see the commander symbol, you will place a commander card on top of an enemy ship, replacing its abilities. The commander will also usually bring additional ships to the fight. What’s great about defeating commanders is that you can get better rewards, including the Epic upgrades! The toughest battles come when you go up against warlords. These battles are similar to the others, but warlords have their own wave cards (ships and, sometimes, commanders) and abilities. You’ll need to get past those waves of ships and take down the warlord’s hull to defeat him. As you go from assignment to assignment, days will pass by and you’ll be moving to new regions and reaching higher tiers. With each tier come tougher enemies since each enemy ship will have more health and will gain crew members (more dice). When you complete assignments, you’ll have a chance to go back to the resupply to repair your ship and buy new upgrades. After going to the resupply you have the option of trading crew members, scrap, and/or ship systems with other players. Each mission tells you what you’ll need to do to be successful. If you aren’t able to upgrade your ship well enough throughout the game, you could just lose on the final day of that mission. If you want to play more than one mission with your ship, you can keep the upgrades you’ve bought and play the game’s campaign mode. Zephyr: Winds of Change is one of the best-looking co-op games we’ve played. 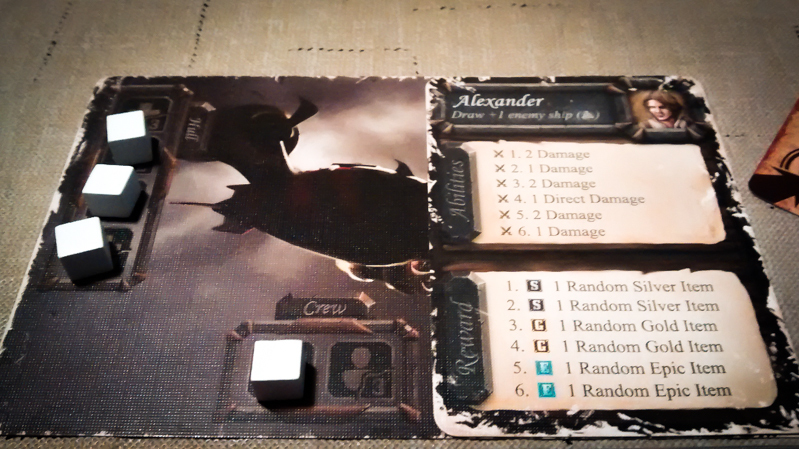 The player boards are fantastic, the artwork on the cards is great, the look of the crew member cards on top of their faction cards is awesome, and even the dice add to the overall look of the game. The steampunk theme is extremely cool and it’s the main reason why we’ll be playing this game a lot. The game does a great job of bringing the theme to life with the ship boards, the text on the event cards, and all of those battles you’ll be involved in. There is a ton of replay value here. You can set up your ship any way that you want to, there are a ton of crew member personalities to choose from, and you never know who you’re going to have to fight. It also scales really well. I haven’t played a three-player game yet, but it seems like the challenge and overall fun factor has been the same at one, two, and four players. The campaign mode actually works really well in this game. You become pretty attached to your ship after upgrading it over the course of a mission, so it’s pretty awesome that you can continue using that same ship in future missions. The Zephyr: Winds of Change rulebook looks fantastic, but it’s not formatted in the best of ways. I did learn the basics of the game by reading through the rulebook and the tutorial book (multiple times), but I had to get a lot of my questions answered at the game’s BGG page. There can be some downtime in this game. You will run into situations where you’ve finished part of your assignment and you have to wait a while for others to go through their battles. It’s not boring by any means, but you can grow a bit impatient when this happens. This is definitely a collaborative board game since you have a shared goal and you can fight in battles together, but you’re often out doing your own thing. This is especially true during missions when you have to complete a bunch of assignments. That’s not necessarily a bad thing, but some people might prefer co-op games that have players work together a bit more. Zephyr: Winds of Change is a solid co-op adventure game that has a theme most people will be able to get into. What we really like about Zephyr is that it feels like a unique cooperative experience and it looks amazing on the table. It’s also quite difficult to beat at times, which is always a good thing to us. If the steampunk theme doesn’t interest you, you might want to pass on this one since it kind of requires you to role-play a bit to get the most out of the experience. Also, there’s less player interaction than in most other co-ops. If those things don’t bother you, then we definitely recommend playing this one! Thanks for taking the time to read our Zephyr: Winds of Change review! And thank you to Portal Dragon for providing us with a copy of this game.